I am honored to have Bettie join us here today! The lush 63 acres at Hammersmith Farm, the childhood home of Jacqueline Bouvier Kennedy Onassis. Photo credit: Alexander Nesbitt for Living Newport: Houses, People, Style. Bettie and her husband live year-round in Newport. Bettie’s design talents and love of landscape were put to use in the design and building of their home, Parterre. An accomplished hostess and active community leader, Bettie has chaired many events that are staples of the social season, including seven years with the Newport Flower Show. 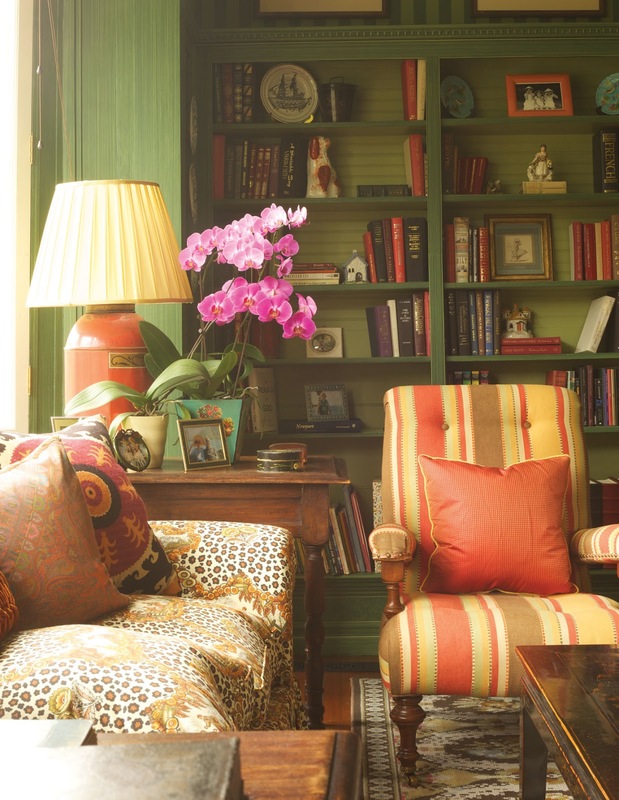 She has lectured extensively in the garden club and design world around the country. Most importantly, Bettie embraces the ethos of giving back, especially to the Newport community. Q: What made you and your husband decide to move to Newport? A: My husband, Jonathan, is from Newport; for his business, we had moved from Atlanta to NY to Boston, so it was an easy decision to make our weekend home a full time residence. Parterre’s often-toured gardens are documented in the Archives of American Gardens at the Smithsonian Institution and are featured in the Garden Club of America’s Gardens, Private and Personal, in which the frontispiece highlights the Parterre Bench designed by Bettie. Q: Newport sounds like a magical land untouched by time. What do you find are its greatest charms, and how does Newport inspire you? A: Newport’s sophisticated charm has a ‘vibe’ that heralds the next chapter in this town’s history-repeating-itself scenario — attracting a vibrant new crowd and social energy to our shores… It is these impressions that inspired me to take pen to paper and write my most recent book, Living Newport: Houses, People, Style and now blog, Private Newport, to celebrate the private side of this City by the Sea through the prism of those who had the means and opportunity to live anywhere but chose Newport. Q: In his recent guest post for your blog, photographer Nick Mele said, “In many ways Newport, Rhode Island is one of the last bastions of old school American high society. The grand houses of yesteryear still stand, often untouched by modern renovation and style.” What are some other examples still remaining of the old guard? A: They don’t tear down homes, their favorite hors d’oeuvres is a small toast round with crunchy peanut butter topped with crumbled bacon (referred to as “Newport caviar”) and they don’t seek publicity. “Many Newport kitchens haven’t been updated in years. They are functional, not showy. Their modesty is a delightful contrast to the magnificent ballrooms, dining rooms, and gardens whose purpose is entertaining,” said Nick Mele for Private Newport. Q: Are there many similarities between Palm Beach and Newport? Photo credit: Mick Hales for Living Newport: Houses, People, Style. Q: Your professional background is incredibly inspiring to me. How did you become interested in journalism, and what are some of your favorite career highlights? And finally, to wrap up the journalism note, the decision to build our home in Newport prompted my first coffee table book, Private Newport: At Home and in the Garden followed by Living Newport: Houses, People, Style. Other career highlights? My upscale catalog company in Atlanta, “Papillon,” that was an offspring of my needlepoint shop which I started right after college. As we grew into lifestyle products (i.e. tabletop, entertaining essentials, decorative accessories and furnishings) the by-line of my catalog was birthed… “The Art of Living Graciously.” And this was way before the word “lifestyle” became part of our lexicon. Ronald Lee Fleming was inspired by Villa Lante in Italy when creating the “American Renaissance Water Garden” at his Newport home. Photo Credit: Meredith Brower for Living Newport: Houses, People, Style. Q: Your garden is truly amazing. How did you develop your green thumb? And how did you become interested in interior design? A: I came late to the gardening game, but like so many, once bitten it was enthusiasm that drove me…attending every garden tour I had time for, peppering established gardeners with questions, pouring through books. It was all about immersion! And the same with interior design, though I am a design graduate of UCLA so that study started much earlier than gardening. As the warm weather approaches, Bettie’s tulips begin to bloom in front of the orangerie. 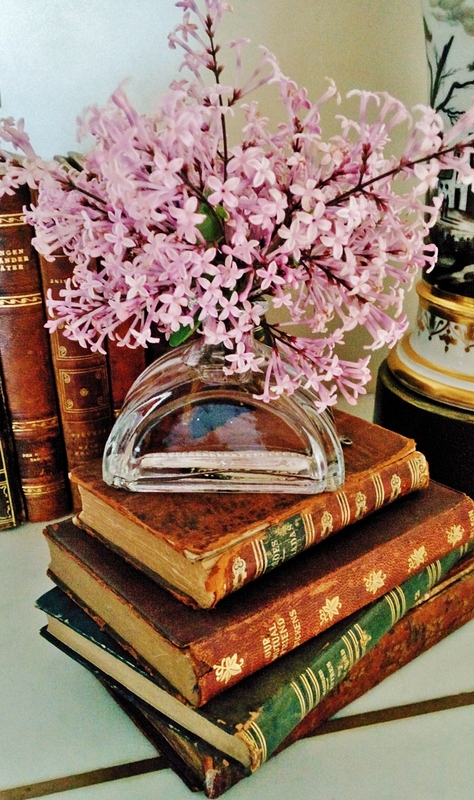 Bettie enjoys using vintage perfume bottles as vases for the beautiful clippings from her garden. Such a lovely idea! “On my first trip to Paris, I bought Arpege perfume first because I fell in love with the bottle; filled with two or three stems, it joins other perfume bottles on my bathroom sink,” said Bettie via Instagram. “Placing the lid beside its container filled with daffodils adds the final touch to a mantle vignette,” said Bettie via Instagram. Q: I love that you founded a needlepoint store in Atlanta! I have recently begun to needlepoint, and I am completely obsessed. I would love to learn more about your favorite pieces, and hopefully see a few pictures! A: Thank you for letting me take this trip down memory lane. I was just in North Carolina for a wedding and our host pulled out some old designs that his mother had done from my shop many, many years ago. Oh, the stories and the lovely customers…here are a few designs (I have vellums and original canvases stacked up in my studio because I just can’t bring myself to toss them out). These photos are taken in my house, some favorites that still fit my design aesthetic after all these years…and were stitched by me. A blue and white geometric 4 ½’ x 2’ rug that was created by counting out every stitch by stitch. “Shells were one of our most popular designs; once the painted shell had been stitched, the background and border were counted out stitch by stitch,” said Bettie. Chinese designs were a favorite and this, in petitpoint, Bettie copied from an antique textile. Q: Where in the South did you grow up, and how did this guide and inspire you to where you are today? “Every time I walk into my dressing room I see my mother’s designer shoes, propped up on my chair, elegant watered-silk taffeta Herbert Levine’s (7 AAAA) from way back in the 60s,” said Bettie via Instagram. Q: I have been taking keen note of your fabulous hostessing skills! Can you tell me more about your popular lecture “Entertaining, Newport Style….when Grace Kelly was a Guest”? With its exceptional ocean views “Seaweed” had been home to the same family for more than 100 years before it was recently purchased by its current owners. Photo credit: Mick Hales for Living Newport: Houses, People, Style. Q: Please tell me about your favorite causes, and the importance of giving back. A: Giving back to the community is the essence of gracious living; it’s also following in the tradition of a town that has existed for over 375 years! From the Redwood Library and Athenaeum (our country’s oldest circulating library, 1747) to the Aquidneck Island Land Trust to the Boys and Girls Club, and many more deserving, well supported causes in Newport that contribute to the quality of life we all enjoy here. Q: Please tell me about your newly released Parterre Bench. A: A very exciting debut took place last week…the “Parterre Bench,” which I designed for my garden a few years back and have now decided to make this iconic accessory available to others. I was inspired by a bench in an Irish garden I had visited 35 years ago! But what makes this especially meaningful to me is that it substantiates holding on to a vision, no matter how long it might take to realize. The Parterre Bench as featured via Traditional Home on Instagram on Sunday. Thank you Bettie for providing such an elegant glimpse inside your enchanted world. I am now ready to pack my bags and move to Newport! Bettie’s book Living Newport: Houses, People, Style and her first book Private Newport: At Home and in the Garden are available through her website. For inquiries regarding the Parterre bench, please click here. And you will want to subscribe to her blog Private Newport for ongoing inspiration! What a fabulous interview! I am a huge fan of hers and the book Private Newport is one of my all time faves, given it many times as a gift. Cannot wait to get the new one, I know its going to be fabulous. She has exquisite taste and I love that she has stayed true to elegant timeless traditions. I know if we band togehter these will be alive and well again, this new generation has no idea what they are missing:) This was a treat…happy July 4th weekend! Another fabulous GP post! I believe that Nick Mele is related to Oatsie Charles…I need to get a copy of Bettie's book, I had perused it and thought what a beauty- funny – our friend and fellow designer, Michael Devine, was just in Newport for the Flower Show, and did a beautiful table on the terrace of Rosecliff, using his own fabrics and china designs (Marie Daage) If you want to see it, it is featured on the Trad Home Instagram feed in a video- and I also posted it onto my FB page… Have a truly fabulous and delightful Fourth!